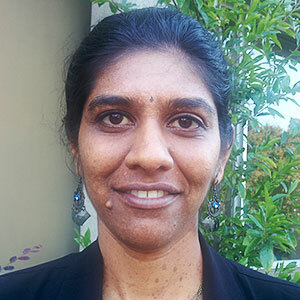 Vandhana is a bioinformatician at the Stanford Center for Genomics and Personalized Medicine and is embedded with the Clinical Genomics Service R&D team at the Stanford Hospitals. Her current role involves implementing scalable, repeatable and traceable computational pipelines on the cloud. Her focus is to establish best practice analysis protocols in a systematic data driven manner and eke out maximum accuracy from sequence data. Vandhana is passionate about genomics based research and personalized medicine to aid physicians with diagnosis of diseases and conditions. Previously, Vandhana was a researcher at the Western Regional Small Grains Genotyping Laboratory, USDA-ARS where she led the bioinformatics research and services including building the facility’s computational core. Vandhana received her Master’s in Computer Science from Washington State University and a Master’s in Bioinformatics and Computational Biology from University of Idaho. Her prior research experiences include human microbiome with an emphasis on women’s health, fruit and archaeal genomics, and wheat genetics. As clinical genomics becomes increasingly prominent, there is still no standard method for variant detection, hence pipeline evaluation is critical. Challenges include finding a reliable truth set to measure sensitivity and specificity, and ambiguity of variant classification between tools. Our reproducible approach tests and validates SNP/Indel calling pipelines using NIST data and precision FDA metrics. Session Synopsis: Precision medicine centers are now an integral part of research and medical institutions. However, they face many challenges as they integrate enabling-technology platforms to achieve throughput goals, build biological repositories, analyze data, or enable translational research. This session will reveal some of the challenges, solutions, observations and best practices that a number of these centers encounter.